"Two experts tackle one of the most formidable and pervasive developmental issues facing children today. With a foreword by Temple Grandin--for children with sensory integration issues-those who have difficulty processing everyday sensations and exhibit unusual behaviors such as avoiding or seeking out touch, movement, sounds, and sights--this groundbreaking book is an invaluable resource. Long thought to affect only autistic children, or mistaken for ADHD, SI dysfunction is finally being recognized as a separate condition. Coauthored by a pediatric occupational therapist and a parent of a child with SI dysfunction, Raising a Sensory Smart Child is as warm and accessible as it is authoritative and detailed and is an indispensable guide for parents, therapists, and teachers who will turn to it again and again." This is one of 2 great books on the market for sensory integration issues (SI). While the Out of Sync Child deals mostly with what SI is, this book offers help directly to the parent with what they face daily and provides a breif intro to what SI is. This book is chalked full of helpful resources from where to find SI products, to help with IEPs,on line support groups and how to help a teen with SI issues. This is a well rounded book that is more useful for younger kids' parents but would be an asset for those with older kids as well. What does sensory integration (SI) dysfunction feel like? Authors Lindsey Biel, MA, OTR/L, and Nancy Peske, parent of a child with SI dysfunction, ask the reader to imagine how an adult with SI dysfunction might feel while preparing a spaghetti dinner in her own kitchen. Through vivid illustrations like this, Raising a Sensory Smart Child: The Definitive Handbook for Helping Your Child with Sensory Integration Issues continually reminds readers that children with SI dysfunction do not experience the world as we do. They need their parents' help to learn how to self-regulate, adapt and overcome. The evaluation and treatment of Peske's son, as seen through the eyes of parent and therapist, demonstrate key points and provide continuity throughout the book. Biel and Peske explain the sophisticated reasoning of occupational therapists - what may look like "play" to a parent is actually a well-planned response to minute-by-minute observations performed by a skilled practitioner. Sensory Smart's most helpful aspect is teaching parents how to be better observers and analyzers of behavior. The book abounds with checklists-from signs of sensory overload to self-help, cognitive and self-regulation benchmarks. Chapter seven, "Practical Solutions for Everyday Sensory Problems," offers effective suggestions for problematic activities familiar to pediatric therapists-hair washing, bathing, mealtimes, parties and more. Websites and toll-free numbers are included in the text for immediate use and are repeated in an appendix for handy reference. After reading this book, parents will be able to take advantage of everyday opportunities to address specific SI challenges. The authors are constantly optimistic and encouraging about potential - the potential of parents and children to develop sensory smarts, and the potential of children to become happy, productive adults. At the same time, Biel and Peske are realistic about human nature. Parents won't be discouraged if they can't provide the optimum environment 24 hours a day, seven days a week. What could the authors have done better? There are few charts, illustrations and photos, making this a very text-heavy read. A greater variety of font sizes and types, and more bullets, charts and photos would break things up visually, especially important for busy parents. I would also recommend repeating all the checklists in a single appendix. One last point: Biel and Peske offer sound advice for choosing a therapist (p. 104), counsel that serves as a wonderful reminder and pick-me-up to pediatric therapists: "Good technique and good intentions are crucial, but they are inadequate in and of themselves. Find someone who is very skilled and who will also love your child and create a safe, warm environment in which your child can express himself and flourish. Because only a therapist - or any caregiver for that matter - with an open, loving heart and a good eye and ear for spoken and unspoken needs will really be able to help." Authors Lindsey Biel and Nancy Peske have done a bang-up job in explaining to the 'everyday man' the vast and far-reaching effects of sensory challenges. As our world gets faster, louder, more crowded and stress-laden, it's not just kids with disabilities who experience sensory issues. It's all kids, to some extent or another. Take that one step further: all people. Yet many know little about sensory dysfunction and how much it can compromise learning and functioning on a daily basis. As a writer/editor in the field of autism/Asperger's, I've read many a book about sensory integration. What makes this one stand out is the clear, conversational tone coupled with page after page of practical, helpful information. The authors explain sensory integration (yes, the SEVEN senses! ), describe how to recognize it in your child (or yourself! ), tell you about the professionals in the field, then go on to detail tons of everyday solutions that can make a difference in the life of your child or student. The all-important topics of nutrition, stress, sleep, and behavior issues are given their due; there's even resources for toys and equipment included. Destined to become your 'bible' of sensory integration! The best and most practical guide for anyone who wants to understand and help a child with sensory integration!!! I am a mother of a sensory child. This book changed my life, and it is an essential resource for anyone who wants to learn or help a child with sensory integration. It is my "Bible". 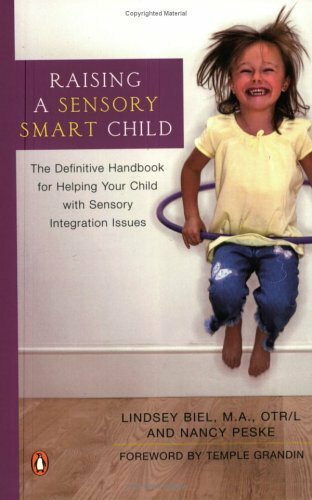 Unlike most books on sensory integration, it was written by a mother Nancy Peske, and an OT, Lindsey Biel, who understand what it is like to have and raise and treat a sensory child. It is easy to read and understand and begins by telling a story of Nancy Peske's own personal experiences with her own child to explain what it is like to have a sensory child, and to accept that you have a sensory child and how to help your sensory child. This wonderful book provides practical solutions for everyday living. This book truly helps you to understand what sensory issues are, and what the technical language means (in easy to understand explanations and examples). This book is the best I have ever read with respect to providing specific techniques you can use to help your sensory child to eat, play, sleep and learn efficiently, to focus, to pay attention, to organize, to self-regulate and so much more. This book also tells you what you can do as a parent to help advocate for your child. It provides the steps for evaluation, and the types of therapies which are available at home and what to expect when you work with an OT. The book also contains information on how to set up an IEP or a 504 plan for your child and how to get the services you need to help your child. This book is extremely practical and what I like the best about it, is that is written like a handbook, so that if you already are familiar with sensory integration, you can read any chapter without having to read the entire book to find the resources that you need. The book provides plenty of links to current research and valuable sources of information in books, videos, DVDs and online, which have made such a huge difference in my life and my son's life! I have read all the books and research on the internet out there on sensory integration and this book is definitely the best. I recommend it to any parent, teacher, caregiver, OT or friend who wants to help understand and/or successfully treat a child with sensory integration. This book is SOOO helpful! The plethora of "experts" in child pathology is troublesome; seems like everyone's trying to make a buck from desperate parents. Parents need to consider how expert the "expert" really is. They also need to consider that there is no evidence of "sensory integration disorder." Slapping pop OT labels on problems doesn't aid our understanding; rather, it detracts from it. I'm a mental health therapist as well as a parent of a child with SPD. This is my favorite book both for myself and the parents of my SPD clients. This book is great for family members of kids with SPD, without additional disorders.